EDI has entered into a new phase of research activity with 31 case studies now underway after they were selected for EDI funding following two requests for proposals. All projects use a variety of methodologies suitable for addressing the complex and under-researched issue of interactions between formal and informal institutions. 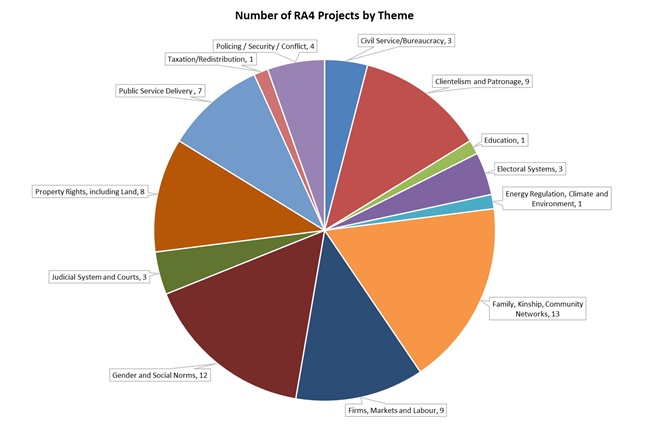 About one-third of the 31 selected projects have government partners and most others have links with Non-Governmental Organizations or other private partners. This lays the foundation for both policy engagement and novel contributions to the academic literature. The purpose of the EDI Case Studies activity is to focus on changes in institutions over time, examine the interactions between formal and informal institutions, and understand their effect on a range of outcomes. This is informed by the view that the process of structural transformation is associated with increased formalisation in a range of ways. As such, the research is highly complementary to other EDI activities and seeks to fill the research gaps identified by the pathfinding papers produced at the start of the EDI programme. The research underway spans a wide range of themes – such as the political economy of institutions, informal networks, gender, social norms, clientelism and patronage, the private sector, land rights, public service delivery, the judiciary, and policing (see pie chart below). Browse our summaries of these Case Studies to find out more about the research that is now underway through EDI.